Home Rule became a leading issue from the 1870s across the British Isles. Aspirations to limited legislative autonomy were notably strong in Ireland, where a Home Rule party progressively emerged and came to play a major role on the island and at Westminster. While the question of Irish Home Rule in particular came to dominate discussions, the quest for self-government did not limit itself to Ireland but soon spread to other parts of the United Kingdom. 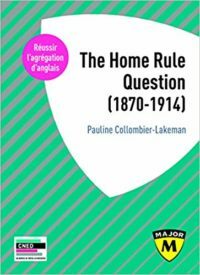 In Scotland and Wales, Home Rule movements also came to life with specificities of their own, leading to exchanges on the idea of « home rule all round ». On a broader scale, Home Rule spurred cross-imperial solidarities and raised the question of the future of the British Empire and the possibility of an « imperial federation ». Although it aroused keen interest and support across Britain and the Empire, it also provoked intense opposition known as loyalism or unionism. In doing so, Home Rule reshaped British politics along new lines.